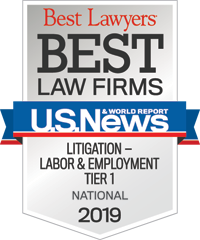 Representing employers before the various federal and state courts of appeals, all the way up to the United States Supreme Court, has always been an integral part of our practice. Winning a case at the trial court is not always enough. In many cases, that initial victory must be defended on appeal. And in those cases where the trial has resulted in an unfavorable verdict or ruling, the appellate process represents the last chance of reversing that result. In certain practice areas where the process is heavily stacked against it, such as litigation before the National Labor Relations Board (NLRB), the employer knows almost immediately upon the filing of a charge that it is likely to lose before the NLRB and that its only hope of prevailing will be in a federal court of appeals. For these reasons, experienced appellate attorneys are essential to providing employers with comprehensive representation in labor and employment matters. Although the trial and appellate processes are inextricably intertwined, there are significant differences between the two. Most notably, factual issues that were the focal point at the trial court are often deemed settled at the appellate level, and the underlying legal issues take precedence. Preciseness in the issues raised and the arguments advanced is critical to achieving success in an appellate court. Taking a “shotgun” approach is a sure road to rejection. Over the last twenty years, the complexity of labor and employment issues has steadily increased. At the same time, the federal courts of appeals, as well as the appellate courts in many states, have become increasingly worker friendly. Our appellate attorneys have the requisite subject-matter knowledge and the appellate experience and ingenuity to ensure that an initial victory is not lost on appeal and to increase the likelihood that an early loss is turned into a final victory. We know that the appellate process is unique and that simply regurgitating briefs and arguments presented to the trial court will not work when the case is on appeal. That is why our appellate team works closely with the trial team to ensure that important legal issues are preserved during the trial and that the case is litigated with the understanding that it may one day come before a three-judge appellate panel. We take pride in knowing when to hold onto an argument and when to fold on an issue or argument that once seemed promising but later threatens to divert attention from much stronger issues and arguments. Our strength lies in our ability to never lose sight of the basic principle that a case is never over until it is over. Represented car rental company before the United States Supreme Court, obtaining unanimous reversal of Ninth Circuit Court of Appeals decision and establishing uniform test for determining a corporation’s principal place of business for purposes of diversity jurisdiction. Represented poultry processor before United States Supreme Court in case involving agricultural status of farm employees under the National Labor Relations Act. Wrote amicus brief on behalf of state of Alabama in landmark Supreme Court case, seeking reversal of Florida Supreme Court decision involving 2000 presidential election issues. Supreme Court vacated Florida Supreme Court decision, leading to certification of election results. Represented nursing home before D.C. Circuit Court of Appeals, obtaining landmark reversal of two-member NLRB decision on statutory quorum grounds. Five other courts of appeals upheld two-member Board decisions, but United States Supreme Court ultimately agreed with D.C. Circuit and arguments we advanced on behalf of client. Represented South Carolina governor and secretary of state before 4thCircuit Court of Appeals, obtaining reversal of district court decision holding state dues-deduction legislation unconstitutional. Fourth Circuit agreed with our argument that the subjective motives of the legislators were irrelevant and that district court should not have permitted testimony from individual legislators regarding intent. Represented medical university before 4thCircuit Court of Appeals in ADA case involving question of first impression; court agreed with our argument that schools are entitled to substantial deference in determining the qualifications of students and the potential for reasonable accommodation. Represented pharmacy services company before California appellate courts, obtaining decision holding for the first time that certain state civil penalty provisions violated the state and federal constitutions. Represented car rental company before 3rdCircuit Court Of Appeals, obtaining reversal of NLRB decision requiring company to furnish certain information to union. Represented cable manufacturer before 4thCircuit Court of Appeals, obtaining reversal of NLRB decision finding strike to be an unfair labor practice strike. Represented large aerospace company before 8thCircuit Court of Appeals, obtaining reversal of federal district court decision requiring company to arbitrate discharge of supervisor. Eighth Circuit agreed with our contention that dispute was outside scope of collective bargaining agreement and not arbitrable. Represented automotive supplier before 7thCircuit Court of Appeals, obtaining an affirmance of favorable district court decision holding that company did not violate collective bargaining agreement by closing union plant and transferring work to nonunion facility. It’s All in the Standard of Review: Is the EEOC’s Transgender Bathroom Guidance "Persuasive" Enough to Survive Court Scrutiny?